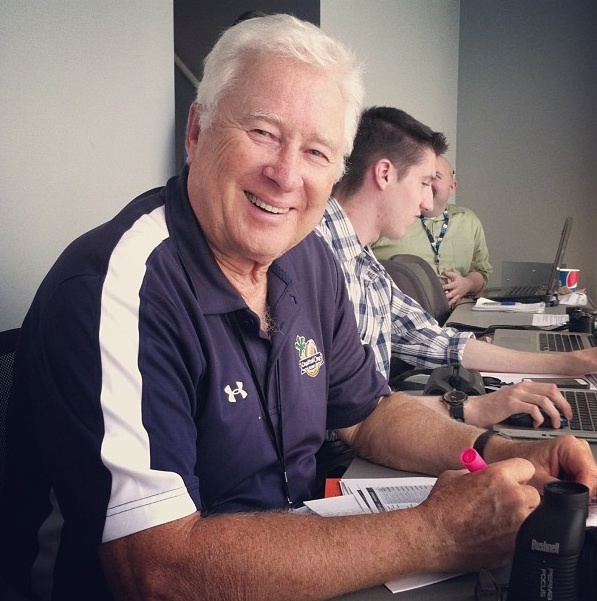 Last Saturday at MetLife Stadium, John Black ’62 settled into the press box for the start of his 38th season in charge of The Football Letter. With the season opener in the books, we asked John about his expectations for the rest of the season, and for the questions he’s eager to see answered. He shares his thoughts and insights below. Enjoy—and hope to see you Saturday at Beaver Stadium. After a successful season opener against Syracuse, it’s interesting to speculate on what we might see as the season progresses. Coaches always say a team improves more between the first and second games than it does at any other time. 1. 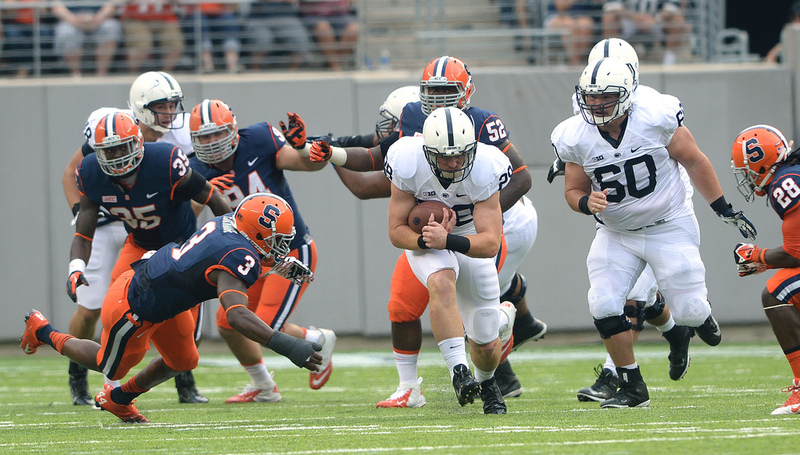 The first thing to watch for on Saturday is improvement in Penn State’s rushing attack. Syracuse tightened up its defense against the run, gambling that a freshman QB couldn’t beat them. The Orange did a great job against the run, holding the Nittany Lions to 57 net yards, but got burned when Christian Hackenberg completed two long TDs to beat them. Two sacks of Hackenberg, a fumble by backup QB Tyler Ferguson, and three knees by the QB to run out the clock subtracted 28 yards from the 85 gained by Penn State’s backs, but that’s still just a 2.74-yard average for Zach Zwinak, Bill Belton, and Ryan Keiser (the holder who gained five yards on a fake field goal). The Lion runners could not get outside, and Zwinak (pictured, below), the returning 1,000-yard rusher who punished opposing defenses for a 4.9-yard average last fall, gained just 61 yards on 24 carries against Syracuse. I think you’ll see the Lions gain a lot more yards on the ground against Eastern Michigan, and gradually improve their rushing attack as the season moves along. We’ll probably get our first glimpse of redshirt freshman Akeel Lynch joining Zwinak and Belton on Saturday. 2. Last year, Penn State’s tight ends ranked second in the nation with 82 catches. But last Saturday, the deepest position on the Lions’ roster got a lot thinner. Early in the second quarter against Syracuse, State lost Matt Lehman for the season after he suffered a severe knee injury while making a cut on the MetLife turf. Kyle Carter, an all-Big Ten tight end as a redshirt freshman last fall, tweaked his wrist. Sophomore Jesse James and true freshman Adam Breneman are the only tight ends who emerged from the season opener unscathed. Watch to see whether Bill O’Brien can continue to get as much production from the position as he did last year. 3. Senior safety Stephen Obeng-Agyapong stepped up to play outside linebacker after Mike Hull was hurt against Syracuse, and also played on special teams. O’Brien cited him as a great multi-positional player. With the number of scholarship players trimmed from 85 to 71 this year by NCAA sanctions, who else will blossom as multi-positional players for the Lions this fall? 4. Allen Robinson had a breakout season in 2012, winning Big Ten Receiver of the Year honors while setting Penn State’s record for catches in year with 77 and gaining 1,013 yards receiving, just 71 yards shy of Bobby Engram’s single-season record. Robinson sat out the first half against Syracuse because of an issue between himself and O’Brien, but still topped all receivers on either team in the second half alone, nabbing seven passes for 133 yards and a touchdown—exceeding his average for a full game in 2012. Will A-Rob be able to break Engram’s records for receiving yardage (1,084) and TD receptions (13) this year? And will he opt for the NFL draft, or stay for his senior season and challenge Engram’s career records as well? 5. Sixteen true freshmen made the travel squad for the opener, and five of them played against Syracuse. How many more true freshmen will earn playing time this season? And who will they be? 6. One of those true freshmen, running back Von Walker from Lock Haven, became the first of O’Brien’s 2013 group of more than 20 “run-ons” to see action, playing on special teams. Which other run-ons will we see on the field before season’s end? 7. Senior leaders like Michael Mauti and Mike Zordich were critical to the Nittany Lions’ success in 2012. Who will emerge as team leaders in 2013? Offensive guard John Urschel and middle linebacker Glenn Carson were game captains for the season opener, and I think they are definitely two of the more mature team leaders. Who else might emerge? Adrian Amos? Ty Howle? Malcolm Willis? Allen Robinson? Gary Gilliam? 8. Penn State has had at least one, and as many as five, Academic All-Americans in 10 of the past 11 seasons. Urschel and defensive end Pete Massaro earned the honors last year. Which Penn State players will achieve that distinction in 2013? This entry was posted in Uncategorized and tagged Akeel Lynch, Allen Robinson, Bill Belton, Bill O'Brien, Christian Hackenberg, Eastern Michigan, Glenn Carson, John Black, John Urschel, Matt Lehman, Michael Mauti, Mike Zordich, Pete Massaro, Ryan Keiser, Stephen Obeng-Agyapong, Syracuse, Von Walker, Zach Zwinak. Bookmark the permalink.